New to the forum and I look forward to buying my first AI. Does anyone have any reviews of how the AI does sailing in rough conditions? 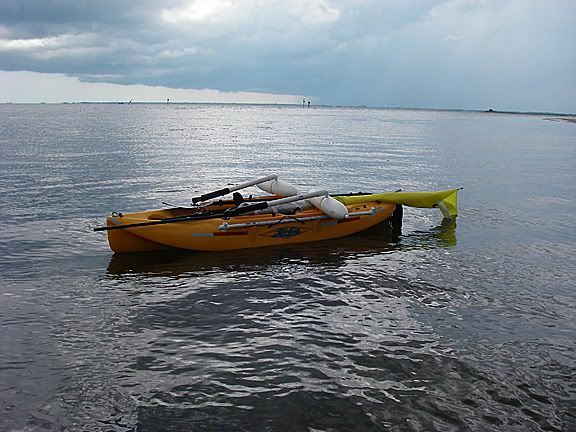 I intend to kayak fish in the Gulf of Mexico and may be a few miles out. Do I need to pick my days carefully or will the AI handle 1' to 3' waves under sail? Your experiences would be helpful thanks. the boat can handle a moderate day in the gulf. 1-2 miles out is quite a ways out in a island but it can be done. Go talk to Capt Kirk at Key Sailing he fishes as much as he sails, he's the best person to talk to in your area, I know he was doing some demos in the Island the other day. ShallowmindedII on the Hobie KFS forum had this to say about that. It wasn't really planned, but yesterday I went over the edge & I made it back. No, I didn't capzise. Launched from the beach of Sarasota and was looking at NW winds of 10-12mph (just below whitecaps wind speed) and a slight 1'-2' chop on the Gulf of Mexico. Those conditions made it easy to just set sail for an out and back course more or less West to East. Started off about 3:30pm with splash pants & a T-shirt on. Gotta love living in Florida. By the time I was done I did have 3 layers on though. In the back of my mind I knew what I was doing, I just sailed due West for about 2 hours and then turned around to head back East & to the beach. That's when I fell off the edge..... of the horizon that is. At that point I was almost 8 miles off shore & out of sight of land. Kind of cool. I made the return trip in just over 1hr20minutes. good to get some more open water experience before my WaterTribe Challenge. A few random thoughts..... I still haven't had the chance to sail downwind in rolling swell/breaking waves. In the last 2 WaterTribes I had conditions of highwinds/breaking waves in my kayak & knew how to react. The type of conditions where during surfing the swells I would take 5-6 waves that would break and hit me on my shoulders. Usually I could paddle out of the way of the white stuff, but not always. I wonder what would happen with the A.I. in the same conditions. Would I broach, turtle or just continue on like nothing happened? The only thing that gave me a little "pucker" was heading back in to the coast and climbing up the face of the small (2' or so) waves/rollers at speeds of 6-8mph. To keep my course I would not fall off the face of the passing swell, but would turn into the face of the wave.At the top, as the wave would pass, the angle felt more like 15-20 degrees instead of the usually 5-7 degrees when heeling. I never felt like the leeward arm would bury & for the most part there was enough power in the rig to carry me thru any waves I hit. Or course, it would be best to have off winds of 10-12mph for 5 days, but I don't count on that. I would have to say that after landing back on the beach (in front of 20 tourists watching the sunset..... how cool is that!) it takes about an hour for me to wipe the smile off my face from the fun I had & for the unique craft Hobie has made. Sunjammer, I know Kirk real well and will be buying from him. I am super excited to upgrade my ride to the AI and do some serious trolling under sail. Thanks for the vote of confidence in the yak in open seas. I've sailed catamarans for years and am comfortable in all but the most wicked conditions. If the boat holds together so will I. Got my AI last Friday!! I got some cute pix of my kid in it over at the KFS website/forum. Anyway, one of the coolest places in the world (IMHO) is Catalina Island, CA. Do you think the journey from mainland CA to Avalon harbor is possible for a flatlander with 1 course in sailing? I have to dream a little. We are measuring snowfall in feet this year. Lake Michigan is more dangerous for sure. Sudden storms. The Pacific is rather tame in comparison. Catalina? That is 26 miles out. Fog, higher winds, off shore Santa Ana winds? All possible issues. Oh yeah... freighters and tankers! I would rather pack it over on the ferry and go from there around the island. Ren - while they use different boats, the C-Brats (owners group for C-Dory small boats) make many trips to Catalina - some in 16 foot boats. They would be happy to explain what to look out for. In general, the old saw of start early in the day is important, esp. going West. Not as bad coming back. Also, some C-Dory ppl routinely cross Lake Michigan. You can search their site, or look up "El and Bill on Halcyon" a web site by an experienced couple who've been there and done that repeatedly. There are definite weather windows to look for in each outing. I have done that trip several times, but in a 50 foot schooner and a 35 foot powerboat. But I would never consider it in a AI or a even in a Hobiecat. You are in open ocean conditions with lots of boat traffic, extremely deep water, strong currents, often large swells, unpredictable wind and weather conditions, and lots of big sharks. Sure, it can be done by a very experienced sailor in a wet suit and the appropriate survival and safety gear, but I would not chance it without a support powerboat within hailing distance. Depending on the time of year, you will also be crossing the migration routes of the California gray whale. Should you happen to come between a mama and her calf (unlikely, but possible), mama might take an instant dislike to you! Just my $.02. Post subject: adventure island in Fiji? I was thinking about taking a trip to fiji with an adventure island. How would i go about shipping the kayak? Would the airline allow me to ship it with the flight for an extra charge? or would i need to ship it specially? Also, what do you think about sailing the adventure island between islands in fiji? how big is the surf down there during the dry season? anyone info on either aspect of this trip would be very helpful. We will be in Fiji next October for the Hobie 16 World Championships. Won't have any time to travel around, but should learn about the area from the locals. For those who haven't seen it, ShallowmindedII posted a follow-up report on the AI after completing the 300+/- mile "Everglades Challenge" the following month. Keep in mind, he is an experienced sailor and had some good seat time with the AI prior to this. He also carried a lot of safety and emergency gear -- just in case! "Hi Hobie-Kats......... all I can say is ya should have been there! This report will be short & to the point of view of you guys. More to follow later when I get a chance to catch up on things. First, all 295 miles in 5 days & at least 2 different Small Craft Warnings and I did not manage to break anything on my AI. I finished the same way I started (but I did wear down the tips of my turbo fins a little). WaterTribe fleet started Saturday morning to Small Craft Warnings across Tampa Bay, winds 15-18knots 2-3 rollers. Made it tuff for some, at 3 of the kayakers got rolled and had to do self rescues, at least 1 (if not 2) sailboats got demasted, another hit a dockside sink and started to take on water, another kayak w/sail rig took on water and snap it's mast. So after 7-9 miles crossing Tampa Bay at least 5 boats were already DNF. I took an outside route into the Gulf and was having the time of my life, but soon the seas& winds got too high. I knew I couldn't win the race in the first 10 miles, but i could lose my race in the first 10 miles if I didn't take care. Headed in the first pass I came to. As usual the pass was very ruff with with an off shore shore bar that caused the rollers to stack up to 3'-5' range had no problem with the white stuff. But, suddenly I was faced with a wave set that got stacked up in front of me instead of behind my. I remember looking down at my GPS at around 6.5mph as I hit the wave. I didn't climb over the wave I went thru it.... the wave was about a 1.5' above my head.... I went thru the wave, not over it...solid water over my head. Came out the other side & thought what a way to start my morning! With a reef to the shorter batten my speeds were anywhere from 5's to 9's. Took the ICW for the rest of the day. No problems with rudder control, just reef. But, I lost count of the number of times I had solid water to the mast. After 3 hours in the Gulf pumped out a couple of gallons of water (a recurring issue). On Sunday night South of Sanibel Island/Fort Meyers in the Gulf I experienced my most exciting/scary night of my sailing career. By sunset the winds had climbed from 5-8knots to 15-18 knots and 3'-5' rollers driven by a North wind. These were the type of wave sets that you hear before you see/feel them. After dark with no moon light it was difficult to time the sets. but, for 4-5 hours I surfed downwind staying in control most of the time. GPS speeds were all over the place... from 4's to over 10, depend where on the wave set I was. Lost track of how many times I had solid water past the mast & across my lap... I mean water that was 6"-10" deep across my legs while moving at 5-7mph. Never felt like the AI was totallllly out of control. The ability of the AI to climb back out a underwater condition was never in doubt. The rest of the trip was in much more "normal" conditions. I did sleep on my AI for 2 nights because of lowtide/mud conditions. When I say mud, I mean baby poo mud that I would sink in past my knees. Not going to get out the boat in those conditions. So just pull out the bed pad & sleeping bag and sleep on the cockpit. It's not too bad if ya tired enough. Bottom line, I was faster by around 11 hours from last year. But, that was due more to the weather than my AI vs seakayak. Peddle drive worked without any problems, but had to pump out my hull on a regular schedule. But remember, for hour after hour I had water crossing the deck at speeds from 4-8mph. Still, water in the hull could be measured in gallons, not ounces. 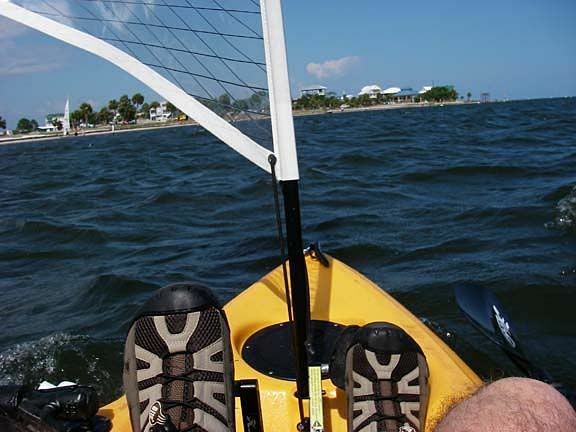 Much much much more comfortable/easier than seakayaking the same distance. In fact I'll throw out a challenge to any AI owner, with 2-3 weeks of training you could do a WaterTribe Challenge with your AI. As long as you have a base of open water skills, know how to navigate by GPS in the dark, and can operate with 4-5 hours of sleep for 4-5 nights you could do this race next March '08. The AI will take care of you. Out of about 38 different types of crafts at the start, 13 went DNF. I finished 14th out of 26 to reach the finish line. The other AI sailed by "Pelican" beat me by about 10 hours, must have been the color! With lots lots of proper training/planning the AI will take you almost whereever you want to go, just be prepared to get wet.... get a dry suit if you live North of Tampa!" Anyway, us locals look at Lake Michigan as a gentle lake. Lake Superior is the one we fear. Lake Huron's winds are worrysome. Erie and Ontario have enough shore to be less of a concern, but are still nice and cold. Lake Michigan doesn't 'warm up' near shore until August!! The Pacific is predictable. No sudden storms... that makes it a great place to sail. Right on, Matt, whereas the Gulf of Mexico and the tropics are just the opposite--lots of sudden storms and rain squalls that can take you from a bright, sunny day to rain so dense your visibility is cut to less than 50 feet, and with wind gusts that can put you on your beam ends in less time than it takes to write this. --to this. And the beach began clearing in a hurry as this rain squall came bearing down on us! But everything was bright and sunny, and no rain at all, when the approximately 50 knot micro-burst hit me. Hey, Roadrunner, I liked reading it again!